After sitting out of the big money advertising race for this year’s Super Bowl, General Motors (NYSE: GM) has announced a purchase of advertising time during Super Bowl XLVIII that will be played on February 2nd 2014. General Motors was among one of the most active automakers in terms of the number of advertising slots for Super Bowl XLVI in 2012 but GM opted to stay in the locker room during this year’s Super Bowl played between the Baltimore Ravens and the San Francisco 49ers. The automaker cited the increase in advertising rates as the cause for them not taking part in the Super Bowl ad blitz earlier this year with prices nearing the $4 million mark for some 30 second slots. That was an increase from the $3.5 million that many were paying for a 30 second spot during Super Bowl XLVI in 2012 and while some reports indicate the Fox is looking to get around $4 million per 30 second spot for Super Bowl XLVIII next February, sources suggest that companies are paying anywhere from $3.5 to $3.8 million – which is very similar to what advertisers were paying for this year’s NFL championship. Of course, some of the prime slots are likely to demand $4 million, if not more so with Super Bowl advertising being “too expensive” this year and rates being pretty much the same for the big game in 2014 – why is GM rejoining the mix now? The 2014 model year is going to be a big one for General Motors – specifically for their trucks. There probably isnt a demographic group that is more keen to buying new trucks and with the 2014 Chevrolet Silverado and 2014 GMC Sierra hitting the market a few months before Super Bowl XLVIII, the 2014 Super Bowl provides a great chance for GM to show off the new trucks to a massive audience. 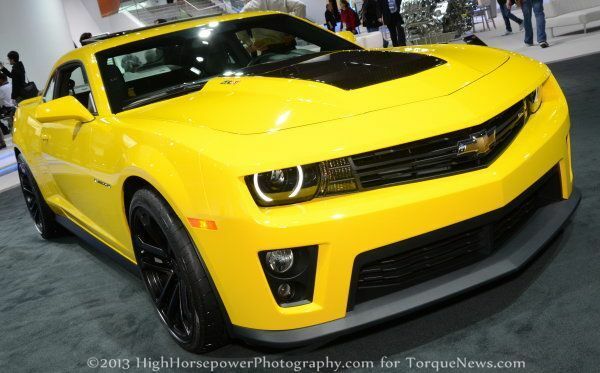 Of course, there is also the new 2014 Corvette Stingray, the refreshed 2014 Camaro and the 2014 SS performance sedan – all of which would seem to be of strong interest to the testosterone fueled NFL crowd. While General Motors has acknowledged their purchase of Super Bowl XLVIII advertising time, the company has declined to mention just how much time they’ve grabbed up. Figure that with six commercial slots for the 2012 Super Bowl and an average cost per 30 seconds of $3.5 million – GM spent around $21 million for their five Chevrolet ads and the one Cadillac ad during Super Bowl XLVI featuring the New York Giants and the New England Patriots. With so many big debuts planned over the course of the next year, GM could certainly find vehicles to promote during the 2014 Super Bowl but it will be interesting to see how many slots they purchase if the rates are slightly higher than they were in 2012. GM could grab a whole lot of attention at the new Super Bowl with five ads and even with the slight increase in costs (compared to the last time GM advertised during the Super Bowl), the company would be spending less than they did in 2012. While General Motors didn’t buy any high priced television advertsing slots during this year’s Super Bowl XLVII, they did have some presence. As has been the case over the past decade, the Super Bowl MVP was given a new GM product and 2013 Super Bowl MVP Joe Flacco was awarded a 2014 Chevrolet Corvette. Unfortunately, the freak power outage during the game forced broadcasters to go to the next program before the Corvette was awarded so the company got next to no exposure for themselves or the new Stingray. GM should probably try to make sure that Fox covers the post game festivities long enough that the MVP is announced and his new GM vehicle (most likely a Corvette, a Camaro or a loaded up SUV) can be driven onto the field and presented. Needless to say, if GM spends $20 million on advertising – they can probably ask Fox to make sure that the MVP vehicle presentation makes it onto the air.